TeamMates Mentoring was founded in 1991 by Tom and Nancy Osborne in order to provide the support and encouragement youth need to graduate from high school and pursue post-secondary education. TeamMates currently provides a mentor to over 7,500 youth in Nebraska, Iowa, Kansas, and Wyoming. 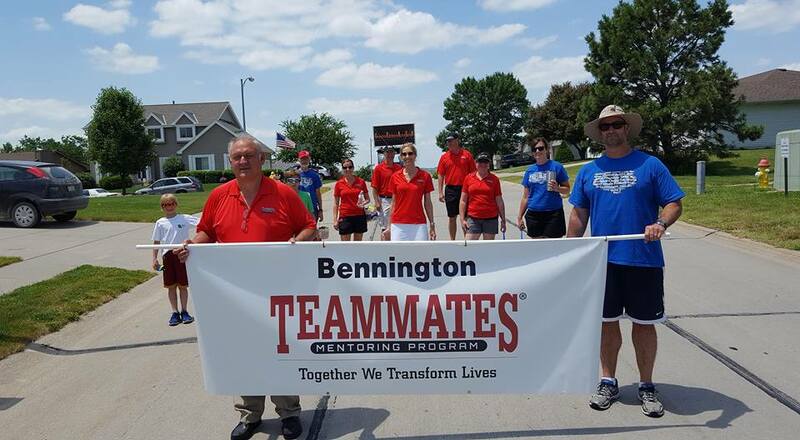 The Foundation started the TeamMates Mentoring of Bennington chapter in the fall of 2014, because the administrators and counselors in our district saw a growing need for this type of program. To date, the Bennington chapter has approximately 68 mentor/mentee matches, with a goal of 90 matches by 2020. A TeamMates mentor is someone who provides a young person with support, friendship and a positive example, inspiring them to reach their full potential. If you would like to hear more information, are interested in becoming a mentor or know someone who would make a good mentor, please contact Program Director, Stan Turner at 402.672.9647 or sturner@bennps.org. TeamMates Board of Directors are: President: Sheryl Cornett, Vice-President: Valerie Calderon, Secretary: Kara Neuverth, Treasurer: Dr. Matt Blomenkamp, Members at Large: Greg Bohn, Theresa Haack, Jason Lura, Regina Meradith, and Janice Saunders.